To remove labels from jars spray until saturated with DYC White Vinegar. Allow to soak for 5-10 minutes and then peel off the label. For multi layered labels you may need to repeat. To prepare jars give them a good wash with hot soapy water, followed by a good rinse to get rid of any odours. Put them upside down into the oven at 140°C for a minimum of 20 minutes. Store in a warm oven until they are ready to be filled. Dry salting is ideal for watery vegetables such as cucumbers. Salting removes excess water and helps keep the pickled produce crisp. Put a layer of salt in a bowl and top with a layer of vegetable slices. Repeat the process, finishing with a good sprinkling of salt. Leave the bowl at room temperature for 24 hours then wash off all the salt with cold water and drain thoroughly. Soaking in brine is best for less juicy produce such as onions. Brining extracts moisture from the vegetables and prevents the vinegar from becoming diluted. Dissolve 10g of salt to every 100ml of water. Put the vegetables in a bowl and pour over enough solution to cover them completely. Leave in a cool place to soak for 12-48 hours then rinse the vegetables with cold water and drain thoroughly. Always use whole herbs and spices rather than ground ones as powdered spices tend to make the chutney go cloudy. For best results, always pickle fresh vegetables or fruit as soon possible after harvesting and never be tempted to use bruised produce. Cut vegetables and fruit into similar sized pieces so they have the same cooking time. Ensure your vegetables are totally immersed in the vinegar solution at all times to stop them from becoming contaminated. Use only non-reactive cooking utensils, jars and lids. Stainless steel, glass and plastic are all suitable materials. Use vinegar-proofed lids, which are usually plastic coated. Never reuse old lids if they are rusty or damaged. 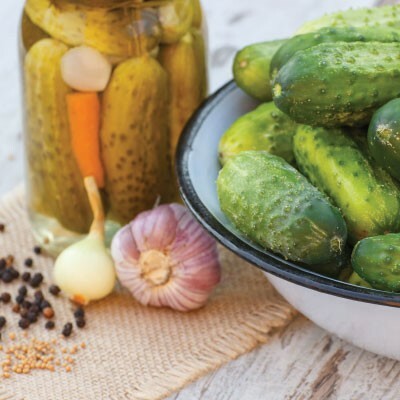 Hard water should not be used in a pickling solution as it will darken the pickles and can cause cloudiness. For best results use soft or distilled water. Product with visible mould should be discarded. The same goes if the product has an unpleasant or ‘off’ odour. If the product fizzes when the lid is unscrewed, but it looks and smells normal, throw it away.